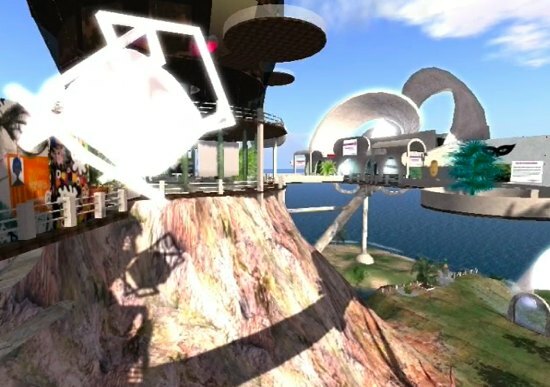 We are well into 2009 and there is a lot of news popping about the likely growth of social virtual worlds and their adoption. As a tangent game based virtual worlds are also still in relative growth as covered in SMH’s post Video games thrash movies and DVD, referring to the shift in Australia and reflected in the rest of the world, of more money spent on interactive vs passive entertainment ” video games industry is now double the size of the box office and more than 40 per cent larger than the movie disc industry in Australia”. 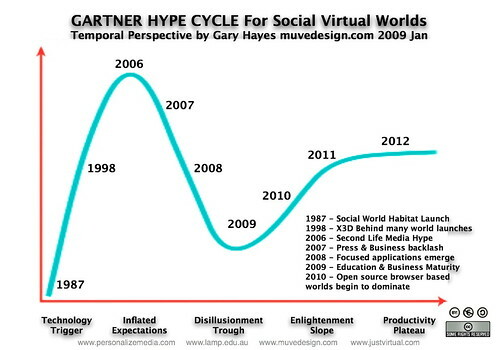 But back to social virtual worlds and I have quickly mapped some dates and SVW events (most are recent) onto a slightly modified Gartner ‘hype cycle’ curve. For the uninitiated here is a brief wikipedia definition. Since 1995, Gartner has used hype cycles to characterize the over-enthusiasm or “hype” and subsequent disappointment that typically happens with the introduction of new technologies. Hype cycles also show how and when technologies move beyond the hype, offer practical benefits and become widely accepted. As well as the increase in venture capital investment across all virtual worlds, the time spent in them, measured in user hours, is growing too. While this is partly due to existing users spending longer it is often the about the typical new user who after the initial log-in hurdles becomes highly engaged for 3-18 months or longer with a particular personally resonant virtual world service. Virtual worlds that offer something beyond mall-like activities (PS3Home springs to mind) or just a glorified chat channel (there are quite a few in this category) will obviously increase engagement. The personalization factor, to make the virtual space YourSpace either by customising other community members work or by creating it from scratch yourself, naturally increases your personal investment. Second Life has always been about Your World and one of the major driving factors is aspirational lifestyle and peer appraisal. We partly escape, we are often out to impress, we love the control but most importantly we like to co-create and communicate with those we like on our terms and in areas we make. There are literally millions of machinimas emanating from the likes of World of Warcraft, Sims, Movies, Halo, Second Life, Half Life and many more. Most are done for the love vs the money and some make it onto the big screen. For the creators it is about expressing ‘their’ world and experiences to each other but of course there is something else as important here. Laurel Papworth talked recently about a machinima I did in Twinity and the ‘free advertising’ it offers for the brand or platform. For me it is also about creating an environment where simple tools encourage large numbers of people to come together remotely and do real-time, collaborative content creation for extended periods. It makes the world very, very sticky when they have shared creative goals and purpose – not just pre-constructed game play. Some may say game quests are social too and I believe when the players get ‘creative’ with the mechanic and ‘bend the rule’ together it certainly is.